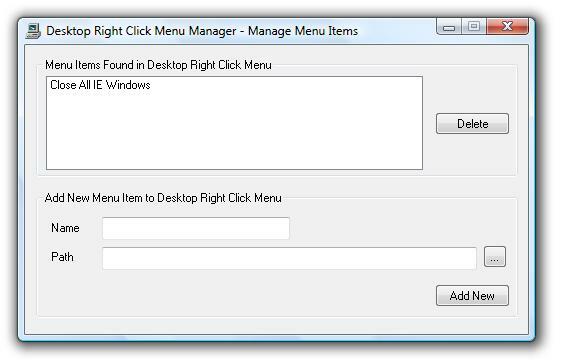 Download and install Desktop Right Click Menu Manager. Launch Desktop Right Click Menu Manager using Desktop Shortcut. Click on Allow on the UAC prompt of Wndows Vista. Now in the main screen of desktop right click menu manager, select the name from the list, you wish to delete (Let's say Close All IE Windows for this example). Now Click on the Button named Delete to delete the menu item from the desktop right click menu. That's it, Verify Desktop Right Click Menu to confirm the deletion. View More About Desktop Right Click Menu Manager Or Find out Alarm Clock, and more.